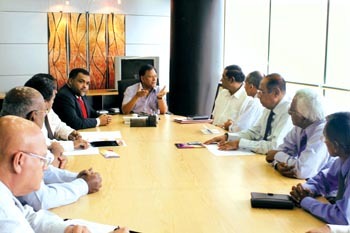 Members of Sri Lanka Gem and Jewellery Association met Minister of Enterprise Development and Investment Promotion Dr. Sarath Amunugama to discuss progress made in the gem and jewellery sector. Chairman of Gem and Jewellery Association Chanaka Ellawala said annual exports of US $ 200 million have been achieved. Minister Amunugama advised Association members to target exports of US $ 1 billion assuring them of the Government’s continued support in achieving this objective. The Association suggested the establishment of a gem laboratory to encourage foreign investment in the gem and jewellery sector. Representatives requested the Minister to make representation to the banks to initiate lending for small and medium scale entrepreneurs in the gem trade. They also have discussed the issues of gem re-exports with the Minister. Minister of Enterprise Development Mano Wijerathna, Chairman, BOI Dammika Perera and Deputy Director General (Investment), BOI, A.M.D. Kulasekera also participated. Sri Lanka should have a strong capital market especially to fund major infrastructure projects in the country. At present Sri Lanka’s capital market is not strong as the banking sector, Executive Director Ernst & Young Malaysia, Chow Hoe said. Society itself has an interest in the conduct of companies because it plays a vital role in economic development, Judge of the Supreme Court of Sri Lanka, Justice Saleem Marsoof, P.C. said at the seminar on `Stakeholders’ interests- mandatory governance in terms of Companies Act’, organised by the Institute of Chartered Secretaries and Administrators. The business community in Sri Lanka has to meet the emerging challenges of globalisation and ensure sustainable growth even with setbacks as a result of the war against terrorism, Managing Director/Chief Executive Officer Ceylon Leather Products Limited Sitendra Senaratne said.